The Alison Sharino Band has received the prestigious Best of 2016 Award from Gigmasters.com! The Alison Sharino Band is a high energy, versatile dance band that appeals to every age group. The band is an amazing group of musicians who love what they do. Alison is a former vocal coach and now brings her expertise to the Alison Sharino Band. When people hear the band, they always comment on the incredible singing, both male and female. Guitar, keyboards, bass, drums, saxophone and four-part harmonies round out the full sound of this fun group. The result is a band with the kind of contagious energy to keep any crowd dancing all night long and a song list that covers every era and style of music. Alison Sharino has performed with the Monterey County Symphony Orchestra, she has sung the National Anthem at four Oakland A’s games and has performed in nightclubs all over the San Francisco and Monterey Bay areas. She has shared the stage with Kenny Loggins, Craig Ferguson, Frank Caliendo, The Fifth Dimension, and Little Anthony and the Imperials. Alison and the band are easy to work with and flexible so as to meet each client’s needs. The band takes fewer breaks than most bands and plays longer sets of music to keep your party going. Always included in the band’s pricing: they will emcee your event (bridal party introductions, announcements, toasts, cake cutting, etc. ), they provide a wireless handheld mic for toasts, they provide event planning worksheets to help you guide the flow of your big day, they provide all their own sound & lighting, they play prerecorded music on breaks, they’ll learn up to 2 new songs of the client’s choice. For more information please contact: Alison Sharino at 559.683.1222 or email. “Thank you so much for all of your hard work and time with Dawn and David’s wedding. They were so happy! You all did a wonderful job! You are so easy to work with and soooo talented. “Alison was personable, professional and a delight to work with. All the guests at our wedding were thrilled with the music and the dance floor was hopping until the very end. Couldn’t have been more pleased. “I just got back from Hawaii and wanted to say how thankful I am for having you and your band in our wedding. You are so talented and such a sweet heart. Thank you for letting our friends Alex and Jin sing and for letting me sing two songs. Your band truly helped make our wedding night a huge success. I’m so happy we found you! “One word… Amazing! Alison and her band were incredibly professional, well priced, easy/fun to work with, very kind, and of course very talented! The Alison Sharino band emceed at my wedding and they gracefully improvised the order of events when thing were running behind or late. They have a great selection of music and everyone was always on the dance floor dancing and singing along. Again, I would highly recommend this band to anyone that is looking for great entertainment at their party or event! If I have another event coming up, I will totally hire them again! “Thank you, you guys were just perfect for our reunion! You are great to work with!! “The Alison Sharino Band was absolutely, hands down the best cover band I have ever heard! Everyone in the band is extremely talented. Between the five members they can sing just about anything and do an outstanding job at it. We had them perform at our 25th wedding anniversary celebration and everyone and I mean everyone was raving about them! I cannot say enough about this band except that if you have need of a band for your party look no further. This band will not disappoint. “We absolutely loved you and your band. Our guest loved all the music, there wasn’t a single complaint. The variety of music was great. It was really hard narrowing down the song list because you know so many songs! I think our guests appreciated the variety of older songs and newer songs. The band had great energy while playing. You can tell you all enjoy entertaining. Our guests really enjoyed the band. We had several people say good-bye to us, then we would see them 20 minutes later on the dance floor! ….Overall, working will Alison throughout the planning process was very easy. Alison was very accommodating and answered all my questions promptly. I would definitely hire the Alison Sharino Band again and would recommend them to future brides. “Alison was always very responsive with each email. The selection is huge and Alison was very accommodating with our requests. Highly recommended. Lots of fun! ….You guys did a great job! Thanks for being so accommodating with the song list and allowing for us to sing with the band. It was quite a memorable experience. “Your band was a great surprise for Paul, and the guests ALL loved the music. Just wanted to send a huge thank you for your trio helping to make Paul’s party such a hit. Despite all of the unforeseen events (major power outage? !, guest in the pool, trip & falls, etc. ), you guys were nothing but wonderful, professional and fun. Thank you for being willing to do whatever it took to make sure we had music. You were absolutely “grace under pressure”!! We’re thinking about a 10-year anniversary party next fall – it would be fun to have your band play for us! “THANK YOU! You and your band did a great job. “We hired The Alison Sharino Band (5 pc.) for our wedding in 2014 and were extremely pleased with their performance. Alison performed music before, during and after the ceremony which was great. The band performed music during dinner and for several hours of dancing that followed. The music was great and had a huge variety that pleased all the different age groups of our guests. They were great on all levels including energy, ability to get people up and dancing (and keep them dancing)–which includes song choice and ability to field all sorts of requests from our guests, and sounded great (vocals and instrumentals). Our guests had only very positive comments about the band. “I had the pleasure of dancing the father/daughter dance when you played “Sunrise, Sunset” at Adam and Angela’s wedding reception at the University Club in Palo Alto. I just want to tell you I was very impressed. I was told that my dancing to your music on that dance brought tears to many of the guests. All I know is that many many of the guest were very impressed. I just want to thank you for the fine performance. “Thank you to Alison and the band for your work at my son’s wedding reception in Palo Alto this past Saturday night. Your work added so much to the enjoyment and success of the evening. I heard the comment, “This band is great!” several times during the evening. A funny anecdote: my wife told me afterward that our seven-year-old great nephew, a normally shy boy who was out on the dance floor a lot, asked his mother on the way home if they could come back again! “Thank you so much for helping to create an amazing day for Shelly and Ryan’s wedding! I really appreciated your helpfulness and willingness to work with me as I coordinated all the vendors and flow throughout the day, and you were so on top of things and flexible – working with you all was truly amazing. You are such a lovely person and I know the couple recognized this as well and were thrilled! “We have had so many wonderful comments about your band! Everyone truly enjoyed your music, the flow of the dancing and the entertaining evening. “Thank you. Minh-Than and I really enjoyed you and the band, you sounded wonderful. Again, thank you so much for helping make our wedding day a special night for us and our guests. ….We booked Alison Sharino for our wedding reception on June 1st 2013 in Santa Cruz, and we could not be more pleased with our experience. Alison was very responsive in communication leading up to the big day. She was also very accommodating as we iterated on the song list. We had Alison play as a soloist during cocktail hour, and she sang beautifully. We had the band play as a trio after dinner, and they were awesome. The rendition of our 1st dance song (which they learned for us) was beautiful. They also did a wonderful job keeping the energy level up for our guests during the dancing portion of the evening, with an excellent mix of songs. A++++ experience! “Thanks again to you and your band for doing such a tremendous job at our wedding! You guys far surpassed our expectations! Thanks again for making our wedding so special! We got so many great compliments about you guys! “From my first contact with Alison to the night of the event, Alison handled everything very professionally. My guests loved this group, I would recommend them to anyone. “Wow, what a great band! Alison is truly is a gifted musician, vocalist, performer and entertainer and has a wonderful group of musicians behind her as well. It readily became obvious to me why her numerous fantastic references can certainly vouch for that fact. “Thanks so much for such a wonderful evening of music at our wedding. Laura and I really really loved the music, the energy, and how pleasant it was working with you, and I think you saw how excited all of our guests were too (we received tons of compliments on the music throughout the evening). The hora music was so much fun (we were all pretty drained after that!) — our guests were both shocked and enamored with how ridiculous and fun that part of the evening was — and your rendition of “You Are the Best Thing” was just perfect. Laura and I talked the next day how we’d love to just bottle up those moments and open it up every now and then. It was so good. “Thank you so much for helping to create an amazing day for Shelly and Ryan’s wedding! I really appreciated your helpfulness and willingness to work with me as I coordinated all the vendors and flow throughout the day, and you were so on top of things and flexible–working with you all was truly amazing. You are such a lovely person and I know the couple recognized this as well and were thrilled! “We have wanted to write you a thank you for the wonderful contribution you and your band made to our wedding and so here it is at last. We just want to say thank you so much. You were great. We have had lots of comments from our family and friends about the music and singing at the ceremony and, of course, at the reception. We all had a great time dancing. I know Ariella and Dominic enjoyed your music (the two kids). I don’t think they sat down all night! We still talk about our wedding and how much we enjoyed your band. When we see friends and family one of the first things they say is how great the band was. Both of us have remarked to ourselves and to others that our wedding was a dream come true and you were a significant part of the reason. First, your ability to command the attention of those in attendance and to keep us on track were impressive. Your introduction of the wedding party at the reception, for example, was excellent. You set forth the names and roles of each member as if you had known them for years, correctly pronouncing their names in a relaxed manner. By the time it was time to go inside for our first dance, you had the crowd in your hands. During our first dance we wanted people to join us early on and you let people know that early in song and the dance floor was quickly filled. When you played our song, Let’s Stay Together, you told people it was our song, during the song you invited people to dance with us and the crowd responded. Obviously, music is your career and if possible you and the band outdid yourselves. We had first experienced your band when you played at the 100th anniversary dinner at SCU’s law school. We thought you were great that evening. Art told people that as far as he was concerned, you were the best dance band he had ever experienced. We both agree that you were even better at our wedding. You cover old standards just like the original recording, and when Stevie Wonder or Martha Reeves emphasize a word or phrase, so does the band. It really makes singing or dancing along that much better. The musicianship of the band impressed us at our wedding even more than at the law school. When Marisela walked down the aisle to At Last, the audience was hooked. One of the guests said he originally thought when the male singer was performing It Had To Be You he thought, at first, it was a recording. We also were impressed and appreciated that you went out of your way to research and find a portable generator to use for our outdoor ceremony. Without that generator, you would not have been able to perform at the ceremony and our ceremony would not have been as wonderful as it was without you and your associate singing. “The Alison Sharino Band were awesome. They kept the party moving and all of our guests loved dancing to their music. We would highly recommend them…. “Absolutely fantastic! All my guests were thrilled. “Just a little note to let you know that you and your band made our party. I really appreciate your talent and your professionalism. So many of my friends and family commented on how wonderful and “rockin’” the band was. It was such fun and of course, Kevin has not stopped talking about how he sang with you! Great fun and I cannot thank you enough for putting me at ease and for simply being the best! “We want them back next year, maybe sooner. All feedback from our club members and guests was positive. We were all very pleased. “Thank you so much, you all did an excellent job. Everyone kept coming up and asking us, ‘Where did you find this band? They are just amazing!’ Our first dance song that you learned for us was perfect, and Alison, you made me cry as I was walking down the aisle, your voice is so beautiful! I love your voice! Thank you for all your hard work and for making such a great party! Everyone loved you and your band. We were so thrilled with the music. Jeannie and I had such a great time and we loved you and your band! We could not have dreamed better, and we are so glad you will be forever a part of our memories! Please tell the rest of your band how happy we are and we give our best to you, your family, and your friends. I gave you 5 stars in every category and a nice review on gigmasters.com [see below]. Your voice was incredible and we are still hearing from our guest about how great you were! The Alison Sharino Band was the greatest! We could not have been happier. Our expectations were completely fulfilled and we are still hearing from our guests about the greatness of this band. Alison played solo for our wedding ceremony and then the complete band played for our wedding reception. Alison’s voice is simply awesome and the band has incredible talent. They even learned 3 new songs especially for us. I would highly recommend this band for any wedding or event. I gave them 5 stars on every category because they earned it! “John and I just arrived home from California and I wanted to thank you and your band from the bottom of my heart for providing the most spectacular music throughout the wedding ceremony, cocktail reception and dinner reception. It was beyond our wildest expectations. With a packed dance floor all evening it was evident that everyone was enjoying themselves. Your seamless transitions from one song to another kept the party flowing. Your amazing voice and topnotch musical talent was truly a wonderful gift to Janene and Ryan. “You and your band are just amazing! We can’t thank you enough for making Danielle and Ruwan’s wedding reception so perfect and so much fun! We are still talking about the great time we all had dancing to your music and how smoothly the evening flowed! You really impressed us all! Please let the rest of the band know how much we appreciated each of you…..your individual talents, enthusiasm, and hard work. Alison, because you were so easy to work with (and spent so much time with us) before the Big Day, I could totally relax at the reception, knowing that everything would happen according to schedule. We’re so glad that we chose to have you sing “I Hope You Dance” rather than switch to the CD. Even though it wasn’t on your play list, you played and sang it equally beautifully. “We were extremely pleased with The Alison Sharino Band’s professionalism, performance, and flexibility. Though we had a detailed schedule for our wedding, some things were not planned and the band handled it very well. We would recommend them to anyone. They provided a wedding timeline worksheet and were very thorough. They made our special day extra special! “We were thrilled with the Alison Sharino Band at our wedding! The songs for our first dance and the father-daughter dance were rare songs that most people hadn’t previously heard (for example, you can’t even find them on YouTube). Alison and her band learned them just for us, and their performance of the songs was unforgettable. One of the guests, who was in a band himself, raved at the range of the band–from country to pop to jazz to rock to oldies to Black Eyed Peas! They also have high integrity and are trustworthy. For example, one of the groomsmen dropped a $100 bill on the dance floor, and a band member made a point to get it back to him. Alison was really helpful in the final weeks leading up to the wedding. She was prepared, professional, and we really enjoyed working with her. We would certainly use the Alison Sharino Band again, and would strongly recommend them to friends and family for their events. “My group of 200 conferees was delighted with the quality and enthusiasm of the Alison Sharino Band. I would hire them again without a moment's hesitation. The entire group was delighted with the band, both the quality of the performance and their professionalism. I'll definitely keep the Alison Sharino Band in mind when the need arises in the future. “We absolutely could not have been any happier with the Alison Sharino Band! Alison was an absolute joy to work with! They had everyone (of all age groups) at our wedding up and dancing. I remember my husband and I standing at the front of the dance floor as people spilled over the dance floor and he said, ‘Just take a minute and look at all the people having fun at our wedding.’ SO many people said it was one of [the best weddings], if not the best wedding they had ever been to. I give a ton of credit to the amazing band! It seriously brings tears to my eyes because I was so overjoyed with their performance at our wedding! “My wife and I want to thank you for being a part of Jeannette and Brian’s wedding this past weekend. It was a friend of ours that suggested you and your band to us and we are glad that she did. The pre-function duet prior to the reception starting was perfect. The variety of music that you performed appealed to all ages at the wedding reception; from my 83-year-old dad to my 14-year-old niece. It was fun to see our wedding party participate by singing along with the band on many of the songs. The dance floor at the reception hall was not big enough for all of the dancers to find room to “let loose” as the dancing was spilling over onto the carpeted areas surrounding the dance floor. 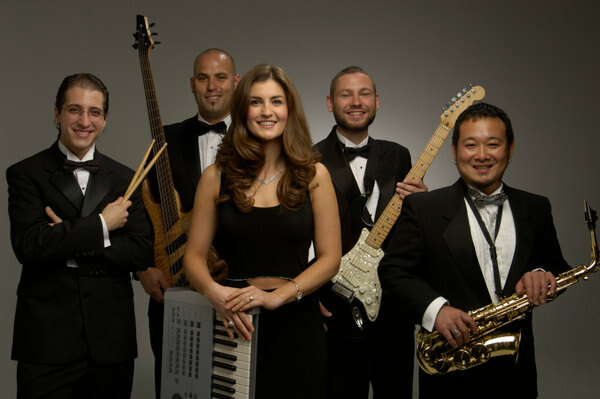 “I would highly recommend hiring The Alison Sharino Band for your event. Alison did a great job of keeping in contact with me before my wedding and answering any questions I had. All of the band members were very talented and I had compliments from all my guests. They were great at adapting to the audience and catering to requests. They are a great band for all age ranges. “Thank you so much for your help in making Rick’s party such a success. Everyone there had a memorable evening — I know that I will never forget it! If anyone would like to call or e-mail for a referral, I am happy to do so. You were truly such a pleasure to work with, and I hope to see you again soon! ….Thanks to the Alison Sharino Trio, we had a fun and memorable birthday party for my husband. They were great—talented, full of energy, easy to work with, and very professional! Alison provided an amazing quantity of music to choose from. There was a wide assortment that appealed to all generations. My husband and son had a great time picking their favorites. Alison was sure to include their choices during the performance. Alison and the other singers had beautiful voices, and their energy level was contagious. We couldn’t get people off the dance floor, even after extending the time an hour from what was originally planned. Guests were still shouting, “One more song!” at the end! We had many compliments from our guests regarding the band. “Working with the Alison Sharino Band was a pleasure. They were professional, accommodating, and really got everyone up and dancing. I would suggest them to anyone. ….We had a great night, in large part because of how great you guys were. I cannot tell you how many people came up to me (sweaty from dancing) to tell me how great the band was!! “We wanted a great party and with The Alison Sharino Band, that’s exactly what we got! Everything was running late and the band adapted well with a great mix of energetic tunes mixed with some slower ones. All of the musicians were solid players and the singing was great. Almost a dozen people came up to me over the course of the night and commented on the great band. Working with Alison before the wedding was really easy even with my crazy busy schedule. The band learned a new song that we wanted for our first dance. It was my duty to find a band for the wedding and I got major brownie points from the in-laws after for finding such a great band. “675 characters is definitely not enough space to express how absolutely fabulous the Alison Sharino Band was for our wedding. They were everything we had hoped for: extremely talented, incredible voices, great personality, tremendous range of music. Oh my gosh, we wish the night, the music, the fun could have gone on for several days. We had not seen Alison and her band perform before, and decided to take a chance after looking and listening to her website. It was one of the best decisions we made. We were so happy and so were our guests, with their performance and professionalism. We would hire them again in a heartbeat! “Three weeks ago our daughter got married. From the very beginning I knew that we wanted a live band and not just a good one but a great one. I can say with confidence that the Alison Sharino Band is a GREAT band. We hired Alison for the entire reception which started at 3:30 in the afternoon and went until 10:30 that night. Alison played the piano and sang solo during the cocktail hour. She has the most beautiful voice and she was a major hit with all of our guests. Most of them in fact could not believe that she was not only a fantastic soloist but also the band leader. Then during the dinner hour she took a brief break and a pair of the other musicians played some excellent jazz until Alison returned. Alison also handled the introductions of the bridal party, and helped us manage the flow of the evening from the toasts, to first dances, to cake cutting, and bouquet toss. Once the full band started playing after dinner, the crowd went wild. The dance floor was overflowing with people; everyone was clapping and singing along with the music. The band kept it going all night. They listened and reacted to the crowd by playing requests and kept the party going. The excitement and energy this band brings to a party is fantastic. They get the crowd moving and jumping and having a great time.